Prime Minister Narendra Modi will address two back-to-back election rallies in West Bengal on April 3, BJP leader Mukul Roy said on Sunday. Mr. Modi will speak at a public meeting at Siliguri in north Bengal at 1 p.m., followed by another rally at Kolkata’s Brigade Parade ground at 3 p.m. on the same day, Mr. Roy said. “The party is fully prepared to hold the two election rallies of Mr. Modi on the same day. It is a historical day for the BJP to organise such big meetings of the Prime Minister back-to-back,” he said. Mr. Roy added that no other party has shown the “courage” to hold two meetings on the same day. Senior BJP leaders including Amit Shah, Nitin Gadkari and Rajnath Singh would also visit West Bengal for campaigning before the general election next month. BJP president Amit Shah addressed an election rally today in Agra extolling the achievements of the Modi government. While he criticised the SP-BSP alliance in UP, he did not spare the Congress party either. Addressing the crowd, Shah claimed that the BJP will win more seats in UP than it did in the 2014 elections. He said that this time PM Modi has the advantage of the five years of selfless service he has put in for the welfare of the 130 crore people of the country, which the Congress couldn’t in 55 years of its reign. He said PM Modi was the only PM who defeated Pakistan not once, but twice. The Congress and the alliance of SP and BSP have banded together only to remove PM Modi from power even though they do not have even a single leader who fits the criteria to be a prime minister. He said Mayawati spoke about removing PM Modi but she does not contest elections herself because she knows that the people will reject her. Shah claimed that the alliance will have one prime minister for each day of the week and on Sundays, the PM’s chair will be empty, while PM Modi works 18 hours a day and has not taken any leave in the past 5 years. Shah said other parties have ruled UP for 20 years, but the state did not develop and neither did corruption go away, whereas, under Modi and Yogi, every house has a gas stove, electric connection, and toilet in the state. He said Yogi Adityanath has shown what model governance is, by not asking for the caste of anyone seeking government assistance. He said under the Modi government, there were no scams and terrorism was wiped out from the country. He said India stands proudly in the world community because of Modi today. Commenting on Samajwadi Party leader Ramgopal Yadav, Amit Shah questioned if terroristswere Yadav’s brothers since he spoke about saving them. He said the country can remain safe only under Modi and the 130 crore people in India should make it their goal this April to make Modi the prime minister again. Addressing the rally, UP CM Yogi Adityanath said that in 2014, the election was contested on Narendra Modi’s name and the people gave an overwhelming response by electing Modi as prime minister. This time too, the whole country wants Modi to become the PM. He said that Modi has brought schemes for the welfare of every section of society. in UP alone, Modi has given 23 lakh houses to the poor people. 2 crore 14 lakh farmers have benefited from the Modi government’s schemes. In UP, organized crime has been wiped out and security has been tightened. Criminals are either in jail or dead. The Kumbh this year has been exemplary and an event of this magnitude has not been held in the state since independence. Former cricketer Gautam Gambhir joined the Bharatiya Janata Party (BJP) on Friday, 22 March. He joined the party in the presence of Union ministers Arun Jaitley and Ravi Shankar Prasad. “I am inspired by Prime Minister Narendra Modi’s vision for India. Will work to make India even better,” said Gambhir, joining the party. He added that he is “honoured” to get the opportunity to join the platform. Jaitley, taking a jibe at the Congress party, said that Gambhir has been “aggressive” against Pakistan on field since his cricketing days and that he will not change his stance. “Match is always won on the front foot and not the back foot,” Jaitley said. Gambhir met BJP President Amit Shah, after joining the party. Gambhir played a key role in India’s triumph in the 2011 World Cup and the 2007 T-20 World Cup. He was also recently given the Padma Shri award. BJP sources told PTI that Gambhir may be fielded from the New Delhi constituency, currently represented by the party’s Meenakshi Lekhi. A final decision is yet to be taken though, they added. In an interview to The Quint, earlier in January, Gambhir said if he ever were to make a foray into politics, people should vote for him not because he was a cricketer, but only if they believe he can deliver. Nirav Modi has been dealt a second blow in the space of just two days – one that he will feel tangibly – as the UK court where he appeared following his arrest by London authorities has rejected the fugitive diamantaire’s bail application. As a result, Nirav Modi will remain in custody till March 29 when the next hearing will be held. Tellingly, the judge, while rejecting the bail application, said that there was substantial grounds to believe that Nirav Modi would fail to surrender if he were granted bail. With Vijay Mallya’s lawyer Anand Doobay representing him in the court, Nirav Modi’s side’s argument was that the charges were politically motivated and that he had been cooperating with agencies. He refused to give consent for his extradition. In terms of the specifics of his arguments, Nirav Modi put up a brazen defence, attempting to tell the court that he had only found out of the PNB scam when he attempted to get a Letter of Understanding (LoU) but was told that he couldn’t and it was illegal. The LoUs had served as the medium by which Nirav Modi had defrauded Indian banks to the tune of Rs 11,400 crore, by using the letters sanctioned by an errant PNB branch to claim massive loans from overseas branches of Indian banks. Nirav Modi and his uncle Mehul Choksi are the prime accused in the bank scam involving fake guarantees in the name of the state-run lender PNB. Fugitive jeweler Nirav Modi is accused in the Rs. 13,000-crore PNB fraud case. NEW DELHI/LONDON: Fugitive jeweler Nirav Modi, prime accused In the Rs. 13,000-crore PNB fraud case, has been arrested in in central London’s Holborn area. He is now being produced in court. On two different occasions, Nirav Modi was seen by the media in London after the UK put out an arrest warrant for him. Nirav Modi and his uncle Mehul Choksi are the prime accused in the bank scam involving fake guarantees in the name of the state-run lender PNB to secure loans overseas. Both left India in January last year before the CBI started investigating the PNB scam. Earlier this month, Nirav Modi was seen walking in London by a reporter of British newspaper The Telegraph. In a two-minute clip shared by the newspaper, the billionaire, was seen wearing a much-talked about expensive ostrich hide jacket, repeatedly said “no comments”. A joint team of CBI and ED will fly to UK to assist the counsel who will be representing the agencies in Nirav Modi’s case. The next date of the hearing (start of the extradition proceedings in judicial side) will be announced by the UK Magistrate court today and accordingly the joint team will leave for UK. The Enforcement Directorate gets permission from Prevention of Money Laundering Court in Mumbai to sell 173 paintings and 11 cars belonging to Nirav Modi. A non-bailable warrant has been against his wife Ami Modi, news agency ANI reports quoting sources. You can run, but cannot hide from the country’s Chowkidar. 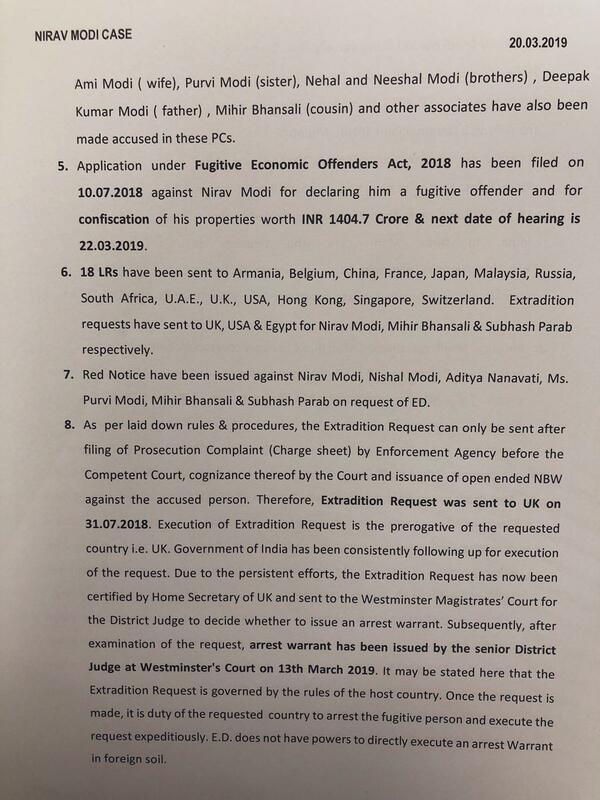 As wheels of justice grind, after Vijay Mallya, fugitive Nirav Modi has been arrested in London. Clear sign that this is not the India which will allow economic offenders to loot the country & evade the long arm of law. 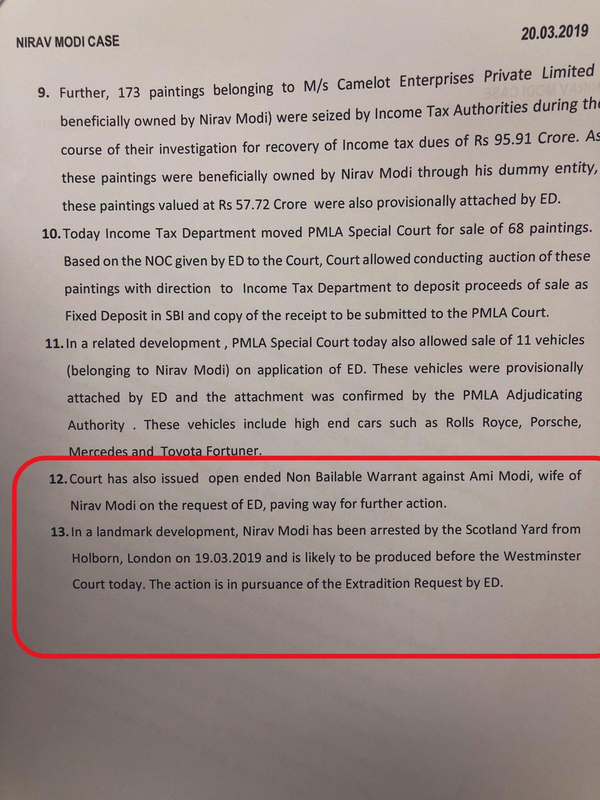 It’s amusing to see the BJP falling over itself to credit the PM with the Nirav Modi arrest while completely ignoring the fact that it was The Telegraph of London and it’s correspondent who found Nirav Modi, not the PM and his agencies. Police said Nirav Modi, 48, had been arrested in the Holborn area of central London on Tuesday and was due to appear at London’s Westminster Magistrates Court on Wednesday, news agency Reuters reports. Nirav Modi said had he has done nothing wrong. The alleged scam was a “civil transaction” that is being blown out of proportion, he said in his reply. UK police say fugitive billionaire Nirav Modi was arrested in London on Tuesday, news agency Reuters reports.